Join other Solaris & Destiny owners to learn more of the amazing things your Baby Lock machine can do. The Solaris & Destiny can do so many things there is no way possible to cover them all in the basic guide class. These classes are designed to help you become comfortable using the many features of this wonderful machine. Each month you will learn new techniques. This Charity Project involves transforming wedding gowns into gowns for tiny babies who never get the chance to come home with their families. These are donated to hospitals and funeral homes around the country so parents have something small and special enough to lay their precious bundle to rest in. Learn to quilt your quilts with your embroidery machine. Come experience the easiest way to make your quilt look like it was quilted by a talented long arm quilter. The secret? It's done in the embroidery hoop. 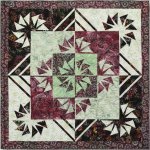 This hands-on class is a must for those who find free motion quilting challenging or don't have enough space for a Handi Quilter longarm on a frame. It is important you are familiar with using your embroidery machine before attending class. 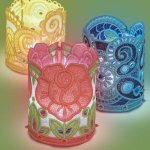 Learn to stitch free standing lace embroidery designs while creating a tea light holder. These machine-embroidered lace pieces are the perfect wrap for battery powered tea lights. This is a totally new technique just released in 2019! It is different from the "Jelly Roll Rugs". This rug is heavier and more cushioned and totally washable! This is a great area rug for most any location inside your home or Studio. A double layer of foam batting provides a wonderful cushion under your feet! It uses a quick zigzag stitched technique using 10" wide strips or Layer Cakes, or 10" wide scraps from your stash. The color options are endless... all one fabric,different fabrics from a Layer Cake Collection or mix and match your own scraps! Rug size approximately 40" x 25". Join us for a fun day in class and you will, most likely, be able to take a finished rug home with you! Learn to use your Deb Tucker, Studio 180 rulers, with any quilt pattern. Many of you have taken classes using the Deb Tucker Studio 180 tools and patterns. Deb's tools add accuracy and precision for the best results in all your quilting projects but many lovely quilt patterns don't include instructions for these tools. Kimberly will show you how to take traditional quilt block instructions and apply process improvement techniques with Deb Tucker's Studio 180 Tools! If you love precision and consistency in your quilting designs, you will love using design rulers and templates! These handy tools assist in placing designs accurately and stitching then out precisely. In this hands- on class you will learn to handle rulers and templates safely with the ruler base and Sure Foot, and how to achieve accuracy with the markings.The wide variety of Handi Quilter rulers will inspire you to new designs heights. You have seen these nostalgic pickups everywhere over the last twelve months. Now is your chance to create one. It would make a fantastic gift for men young and old. Don't be put off by the bright colored sample created to resemble the pattern. Imagine it in shades of blue or red, or even in one or two of the Ombre fabrics(available at Stitch 'N Time). If you have dabbled in applique and are ready for a bit more of a challenge, you can do this! We will spend two days together to help you along the way. It will be fun to see the different interpretations you create of Papa's Pickup. This is a 'quilt of illusion' technique using a fast rotary cutting method and an acrylic diamond template. Reduce your fear of the "Y" seam using a quick, easy method. You will be able to create numerous illusion quilt designs, which show movement and depth on the flat surface of a quilt, just by different placement of the 'cubes'. You will learn how the new ombre fabrics (available at Stitch-N-Time) make it easy to get the proper 'value' for a good looking cubel. This class will be enjoyed by both beginner and expert. If you have ever had to travel with your rulers and/or a cutting mat, this is the project for you. It will save you from juggling or even damaging your tools. The bag is 21" X 26" with 10 pockets (3 on the outside and 7 on the inside). 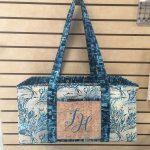 It can hold fabric for class along with rulers and a small cutting mat.The sample at the store is made from Stitch-N-Time fabrics and is embellished with pearled cotton bobbin work. It can also be made from a jelly roll, your stash, or scraps. Pieces must be 22 inches long and can vary in width from 1 1/2" to 3 1/2". Let's get together and have some fun! Jackie Kelso, a fun, certified Judy Niemeyer/ Quiltworx instructor, will step you through the process of constructing this lovely quilt. A sewing technique called foundation paper piecing is used when sewing the pieces onto the foundation units. Curved piecing and traditional piecing skills are required to join the units after the foundation piecing is completed. Learn to use the Baby Lock Triumph and practice the skills that will help you to create professional looking projects.This is a class that offers over 30 different serger techniques. We will "begin at the beginning" by looking at machine operation and proper threading. Many different machine feet and accessories will be presented and tested. Various fabrics and thread will be used. You will be provided a notebook to organize and store information and samples created in class. This can be your go-to personal reference book. We enjoy bringing in national educators from time to time because even though we have been using Baby Lock sergers for years there is always new techniques to learn. Learn a tool and technique that will give you high success adding fabric corners to basic shapes. For years we've been layering small squares on big squares, marking & stitching on a diagonal line, then hoping everything lines up when we fold the small corner section back into place. If you've tried it, you know the pitfalls: too big, too short, too crooked and way too wasteful. No more. With your new Corner Pop tool, you will be able to trim, rather than mark, add an oversized replacement triangle and then square it all to perfect size. You can make twenty-two different sizes - whole, half and quarter inch increments. Increased success without undue stress for every level of quilter. What's not to love? Join Kimberly for this technique class. Join Jackie Kelso, a certified Judy Niemeyer/ Quiltworx instructor, as she teaches the basic skills of paper piecing. You will learn Judy Niemeyer's techniques, including how to prepare Foundation Papers and proper cutting techniques, while constructing this beautiful 40"x 40" wall hanging.